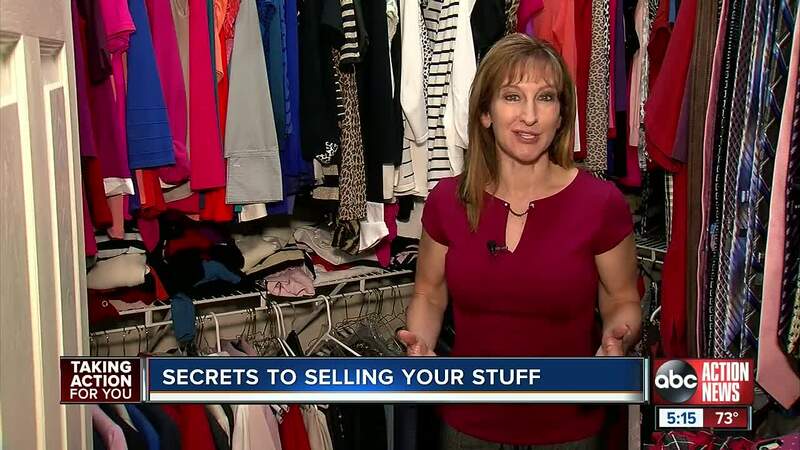 Many people are de-cluttering their lives thanks to the Netflix series "Tidying Up with Marie Kondo," but before you just give away your unwanted stuff, you should know there are many options for you to make decent money selling those items. Online marketplaces are becoming the place to go to make that extra money off of unused stuff around your home. When Diana Blinkhorn’s husband cleaned out their storage shed, she told ABC Action News she saw dollar signs. The stay-at-home mom said she posted the items online and made a $200 profit. “I’ve sold maternity clothes. I’ve sold a steam mop,” Blinkhorn told Consumer Reporter Jackie Callaway. Blinkhorn, a blogger who said she recently made $50 dollars on a weathered storage unit and $100 on a battery-operated riding toy her girls no longer use, prefers the Facebook Marketplace. But other sites like Offer Up and Let It Go are also popular, free and easy to use. Experts say the secret to successful posts is threefold. Blinkhorn says she typically lowers the price if the item does not sell after one week and advises seller to not shy away from selling the small stuff – because sales of $5 or $10 can quickly add up.